COVINGTON, KY-In this age of obsolescence, products that are built to last are rare. But there stands at least one company that built an electronic systems business on the practice of doing a job right, so that relationships with clients last a lot longer than some hardware does today. American Sound and Electronics, Inc. (ASE) was established in 1946, when founder Lou Toerner returned from his World War II service and started going door to door in rural Kentucky, bringing the wonder of wireless radios to those without electricity. Even after the expansion of the power grid caused that particular aspect of his business to fade away, Lou exhibited the attributes that caused ASE to thrive into the next century-a real knack for adapting to new technologies and an ability to make customers happy. 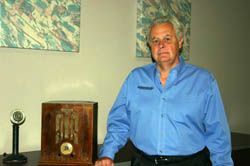 American Sound and Electronics' Jack Toerner is seen here with a radio like the ones his father used to sell door to door when he founded the company 60 years ago. Today, ASE still operates based on this approach to business. Technologies may come and go, but customer relationships and the company's loyal staff provide a stable foundation. Having evolved from the small business Lou ran out of his basement in Covington, KY to a company residing in a 24,000-square-foot custom-built facility in that same town, ASE is now under the leadership of Lou's son, Jack Toerner. Jack was still in high school when he started working part-time for his father 40 years ago, and subsequent to his college education, his roles with ASE have included those of installer, service tech, sales person, secretary-treasurer and then owner of the company as of 1986, when Lou retired. "My father was more technical than I am, but I always enjoyed operations and sales-putting the systems in place so that everything works well," Jack said. Those fine-tuned systems include the ones that ASE has installed in convention centers, houses of worship, schools, restaurants, corporate boardrooms, theaters, and healthcare facilities. The company has also had a long-standing contract with the Cincinnati Bengals to provide the coaches intercom and the referee mic for the NFL. Together, the endeavors grossed the company $6.3 million in 2005. The company's roots are still firmly planted in audio, but video and security systems are part of the packages they sell to clients throughout the nearby Cincinnati, OH area. While the company formerly maintained business music systems for some national accounts, today, Jack said, "We try to stay within a 50 to 60 mile radius of downtown Cincinnati. That way we can provide good service." Some of the company's local relationships span the past few decades, with some employees handling the same accounts they initiated 20 and 30 years ago. In fact, one member of the ASE team, Fred Terry, has been with the company 50 years. That type of long-term loyalty helps with new projects as well as servicing older installations. "It's nice to be able to talk to one of our installers or service techs about a school system they did 15 years ago," Jack said, pointing out that more than one staff member has provided the intricate knowledge to help with renovations on 20-year-old projects. Additionally, he said, "We have customers that request a certain service person, and we're able to do that because they're still with us. That's been very positive as far as the customer service is concerned." For all its years of experience together, the team at ASE is definitely changing with technology, as new recruits with software skills (and a full-time CAD operator) are brought into the fold. But the sales structure within the company supports this evolution. "Years ago we went to a vertical market sales approach," Jack explained. Sales people work within a designated market area, and service personnel mirror those classifications. In both bid work and negotiated design/build projects, this approach provides sales people with the industry-specific expertise to close the deal. Jack has played a part in the changes the industry has seen over the years, holding the role of NSCA president from 1993-1995, and heading up the board of directors for the NSCA Education Foundation when it was established in 1999. In that same year, ASE was actually the first NSCA Education Foundation donor, making a $10,000 gift in honor of Lou Toerner. Education and an ability to anticipate which technologies will provide better service for clientele is certainly a key to longevity in the electronic systems industry. Going forward, Jack clearly expects to keep on learning. "Over the years, this work has gotten easier with computers and software-and definitely much more flexible," he observed. "I can remember when equalization of sound systems came in, and we had all these boxes of filters, and now you have everything you need plus some in one little rack unit. It's just amazing where it's come from."